Scientists from the German Cancer Research Center (Deutsches Krebsforschungszentrum, DKFZ) have now succeeded in restoring the sensitivity of resistant breast cancer cells to tamoxifen using a tiny RNA molecule. These snippets of RNA repress production of a protein that enhances cancer growth. In tissue samples of breast tumors, the investigators found clues that they also play a clinically relevant role. Many breast cancer patients are treated with a drug called tamoxifen. The substance blocks the effect of estrogen and thus suppresses the growth signals of this hormone in cancer cells. When resistance to the drug develops, tumor cells change their growth program: They change their behavior and shape, become more mobile and also adopt the ability to invade surrounding tissue. Scientists working with PD (Associate Professor) Dr. Stefan Wiemann of the German Cancer Research Center (DKFZ) have now also observed these changes in tamoxifen resistant breast cancer cells. By treating breast cancer cells in vitro with regular doses of tamoxifen, Sahin’s team induced resistance of these cells to the drug. As resistance developed, the cancer cells switched to the development program that makes them grow even more invasively and more malignantly. Checking the complete spectrum of microRNAs in the resistant tumor cells, the investigators noticed that production of microRNA 375 was more strongly reduced than others. When they boosted the production of microRNA 375, the cells started responding again to tamoxifen and switched back to their normal growth program. “This strongly suggests that a lack of microRNA 375 both increases malignancy and contributes to resistance development,” says Özgür Sahin. 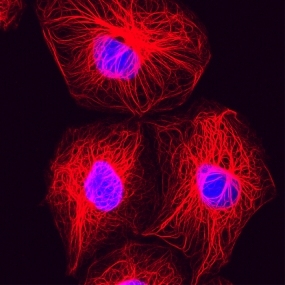 If microRNA 375 levels are low, breast cancer cells increase the production of metadherin. Apparently, microRNA 375 suppresses the production of this cancer-promoting protein in healthy cells. In patients receiving tamoxifen therapy the team found that high metadherin levels in the cancer cells go along with a high risk of recurrence. This suggests that microRNA 375 and metadherin are involved in the development of resistance to tamoxifen. “The analysis of microRNAs in breast cancer has put us on the track of metadherin. We will possibly be able to specifically influence the cancer-promoting properties of this protein in the future,” says Wiemann describing the goal of further research.